(P1) Beijing has OVERTAKEN New York as the city with the highest number of BILLIONAIRES for the first time, a new report by China-based firm Hurun says. (P2) A total of 100 billionaires are now living in the Chinese capital, compared with 95 in New York, the report says. (P3) Shanghai, China’s centre of COMMERCE, comes in fifth place. (P4) Hurun, which tracks wealth in China, has released an annual Global Rich List for the past five years measuring billionaires’ wealth in US dollars. (P5) The private research firm, which also publishes LUXURY magazines, uses a mixture of information from publicly traded companies plus interviews to compile its data. (P6) Other companies such as Forbes and Bloomberg use different METHODOLOGIES and arrive at different conclusions. (P7) Hurun found that Beijing had welcomed 32 new billionaires since last year, allowing it to move past New York, which only added four new billionaires. (P8) Moscow was in third place with 66 billionaires, according to Hurun. (P9) Overall, China has overtaken the US as the country with the highest number of billionaires. However, the top 10 billionaires in Hurun’s list is still dominated by Americans. (P10) China now has 568 billionaires after gaining 90 new ones, compared with the US which has 535. (P11) China’s billionaires boast a combined worth of $1.4 trillion (£1.01 trillion), which is about the same as the entire economic activity of Australia. (P12) Hurun’s chairman Rupert Hoogewerf noted that the growth in China’s wealthy took place despite an economic slowdown and STOCK MARKET INSTABILITY. 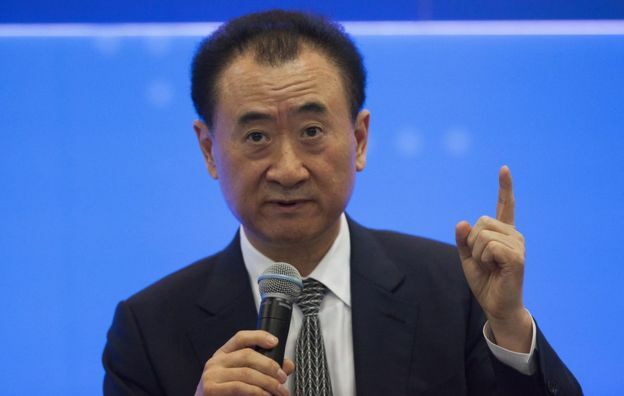 (P13) Hurun found that the richest man in China is still Wang Jianlin (pictured above), with an estimated worth of $26bn (£18.8bn). (P14) But he has not cracked the top 10 billionaires in Hurun’s list, which is dominated by Americans. It is topped by Bill Gates with a NET WORTH of $80bn, followed by INVESTOR Warren Buffett with $68bn. (P15) In third place is Spanish fashion TYCOON Amancio Ortega with a net worth of $64bn. (P16) The report found that overall there are now 2,188 billionaires in the world, a new record. Is an increasing number of billionaires a good thing or a bad thing? Who are the richest people in your country? Why are there so many new billionaires in China and Russia?